Ever since I started reducing the amount of processed foods we eat, Goldfish cheese crackers haven't found a spot in our pantry. The girls for the most part haven't missed them, but the other day they did ask for some fishy crackers for snack. I just ordered some mini-cutters and I think these crackers will be perfect for them. 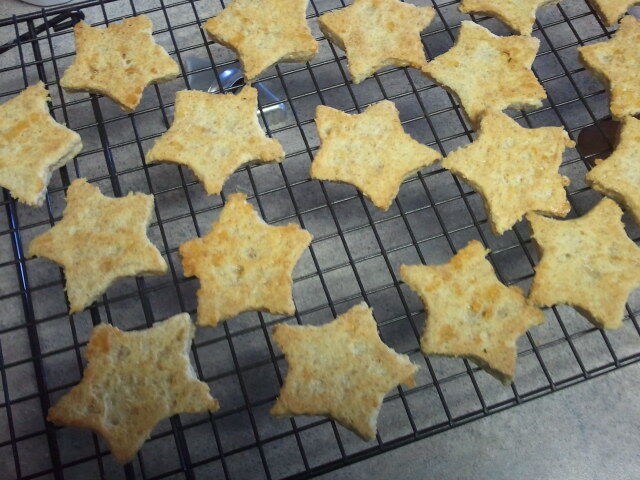 These crackers were a huge hit! Preheat oven to 400 degrees. Put flour into a food processor. Place the butter cubes around and pulse a couple of times until the butter is mixed in. Reserve 1 tbsp of the beaten egg for brushing on top* and mix the rest into the flour. Add a few tbsp of ice cold water, cheese and salt. Mix until dough forms. Using a rolling pin, roll out dough into an 1/8 of an inch. Cut out using whatever shape you want, or cut into strips. Bake for 8-10 minutes until golden brown. *I did not take the time to brush the tops of mine, so they aren't as pretty and golden as they could be. I took a shortcut tonight and used a bottled sauce. One I could have made from scratch, but I had bought it before I started making sauces from scratch and I decided I wanted to try and use it up. It was pretty tasty and it was fast to throw this dinner together. Slice beef into very thin strips going against the grain of the meat. Cut the bell pepper into thin strips too. Slice the mushrooms. In a large pan, add some of the vegetable oil and get it very hot. Add beef but do not try to stir it right away. Let it start to sear. Then after a minute or two, stir it and cook until almost cooked through, only about 4 minutes total. Remove meat from skillet. Drain any fat. Add a bit more vegetable oil and saute vegetables until cooked through. Add beef back in and peanut sauce. Cook until meat is done. Pour over noodles and top with some raw peanuts. Oh YUM! I have been taking advantage of being at home on the east coast. Fresh summer corn and fish from the guy who sells it out of a truck on a highway! Not nearly as sketch as you would think. Mix fresh crushed pepper, a little salt and about 1/4 cup of olive oil. Brush on the oil onto fish before putting it on the medium grill. Cook fish until firm but NOT hard. Scallops should still be a little soft. Serve with your favorite summer veggies and enjoy! Chop and saute onion. Add tomato paste. Cook until you think it just about to burn, to develop the flavor of the tomato paste. Add taco meat leftovers and quickly add the chicken broth. Simmer until thick and heated through. Top with cheese and chips. I made these popsicles today for my twins. They were a huge hit! They especially loved the "clean up" fun after wards! Read here for more details! Blend in a magic bullet or blender. Pour into popsicle molds and freeze for a few hours. Makes about 4. I had some left over pork chops that I had defrosted but hadn't cooked. I didn't want to re-freeze them since that can lower the quality of the meat, so I knew I needed to use them. Problem is, I only like pork chops about once every four or five months! So, I cut the meat off of the bone and I sliced it really thin to use in this stir-fry. Prep vegetables. Cut bell pepper into small slivers. Cut squash, carrot and zucchini in rounds. Cut broccoli in small pieces. Cut pork chop meat off the bones and then slice into thin pieces. Set vegetables and meat aside. Prepare sauce by whisking the soy sauce, rice wine vinegar and honey into a small bowl. Add finely grated ginger and garlic. (I use a rasp to do this.) Add the zest of the orange to the bowl. Squeeze about half of the orange juice into the bowl. Last add the corn starch and whisk until it dissolves. Get a big skillet or wok really hot. Add the coconut oil and quickly add the vegetables. Coconut oil has a low burn point so you don't want it to get too hot in an empty skillet. If you use vegetable oil it isn't as risky. Remove vegetables from the skillet when they start to get soft. Add the pork and stir until just still barely raw. Add vegetables back in and the pour the sauce over top. Cook a couple more minutes to make sure pork is cooked through but not over done. Serve over brown rice with orange slices on the side. Well I won't win any beauty awards with this photograph, but it looked much better in real life. I had a bucket of tomatoes from my garden that I need to cook before they went bad. So I had some homemade tomato sauce simmering away all afternoon but couldn't decide what to do with it. I had pasta last night so I didn't want to make pasta again today. Last time at the store, I bough some acorn squash intending to make my stuffed squash. But I forgot to buy sausage. So I concocted this meal and it was a pretty good hit. Preheat oven to 425. Cut acorn squash in half. Be careful that you don't cut yourself! Scoop out seeds and discard. Sprinkle with salt. Roast cut side up for about 30-45 minutes until a fork can be inserted in the fleshy part with no resistance. Season pork chops with salt and pepper. Stick in the oven with the acorn squash for the last 10 minutes. Pull out squash to cool. Flip pork chops over and switch to HI broil. Cook another 5 minutes until pork chops start to brown a bit. Scoop squash out with a large spoon. Cut into chunks. Top with tomato sauce and a few slivers of parmesan cheese. This isn't exactly a summer dish, but I had all the right ingredients for it and as you might have noticed (due to the lack of posts) I haven't been inspired to cook as much lately. Ever since returning from our vacation at the beginning of the month, I just haven't been in the mood to cook. I'm trying to change that. This stew turned out very delicious. My husband even went back for seconds which is unheard of when it comes to soups and stews. In a medium soup pan, saute onion and mushrooms in olive oil and butter. Add the barley and toast it in the oil. When it starts to brown, quickly add the carrots, celery, ginger and beef broth. Season to taste. Let simmer for an hour and half. *use vegetable broth for a vegetarian meal. Omit butter for a vegan meal. Anything say summertime better than grilled fruit? This would work with pineapples too! Ideally serve this with a small scoop of vanilla ice cream. In a flat shallow dish, mix the lime juice, honey and cinnamon. Cut the peaches in half removing the pit. Place peaches cut side down in the marinade. Let sit for 20-30 minutes. Get grill pan (or outdoor grill, even better!) hot and place the peaches cut side down. Cook until the honey starts to caramelize. Serve with ice cream and drizzle remaining marinade over top.